Flame Broiled: A burner right up the middle, a shot so hot it increases the temperature of the fairway in front of you! Blazing a Trail: Powerful penetration into a dense forest of out of bounds jungle foliage, so deep that it takes a full safari expedition to find your ball. 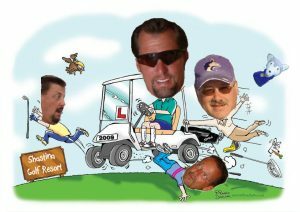 Let The Big Dog Eat: From the movie Tin Cup, the big dog is your #1 club, the bad boy with the biggest club head, and an attitude! Over Cooked: When you put all your effort into your shot in order to get to the green, only to find that you really did connect this time and your ball is now past the green in the parking lot by the clubhouse. Question is, who’s windshield did you break? Previous articleDon’t I Know You?